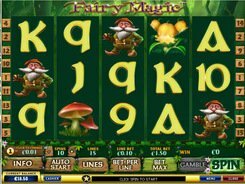 The classic-style Magic Slots developed by Playtech is crafted with three reels and a single line only, still it is favored by many gamers out there. The secret of its success is a progressive jackpot accumulated nearly every second. If you are lucky enough to hit the jackpot, you will be showered with big cash. Before trying your fortune, you need to place a bet of $0.25 to $15 per line. You can go after the progressive jackpot if you wager the maximum bet and line up three Hat and Gloves symbols. 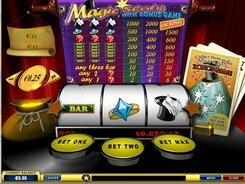 Three Magic Wands on a payline trigger the Bonus Game if playing at the highest stake of $15. In the new bonus screen, you have to pick one hat out of four to reveal your cash prize. PLAY FOR REAL MONEY!